Well, Freaky Tiki Surf-ari has come to a close and I’ve saved what’s often regarded as (and rightfully so) the best for last. Not only do the Ghastly Ones play amazing horror surf jam-packed with horror movie references, but they also sell spooky Tiki mugs! Besides, how can you not love a band named after an Andy Milligan movie? I say “consisted of” since Sir Go Go Ghastly has since left to pursue other projects. Target: Draculon is a musical and visual treat for all horror fans. In addition to the Vampirella injoke title, the album’s artwork consists of pictures and faux movie stills referencing every from “Big Daddy” Roth to The Astro-Zombies. In fact, one of the drawn creatures is clearly based on the infamous Moon Monster that once haunted various comic books. The album itself is themed around the idea of a soundtrack to a nonexistent sci-fi movie, with the music and brief skits forming the story (hence the use of fake stills on the album). 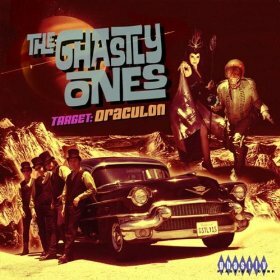 “Target: Draculon,” which starts with fast-paced guitars and drums over organ-sounding keyboards. The occasional shock sound effect is mixed in as well. One can things imagine the animated title sequence of the movie playing over this. They really crank up everything (especially the guitars and organ) for the ending. Light, slow guitar cords open “Without Warning” while medium speed drums and organ appear soon after. The organ fades into the background as the guitars and drums speed up, but reasserts itself not long after. There’s some great guitar work here and it’s got a very creepy feel. “Blood Countess Sees All…” is the first of the album’s skits, where we hear echoing space sounds and the evil laughter of the alien queen played by Necrobella. In “Grave Dig Her,” fast percussion and guitars are equal partners and some light organ work is mixed in as well. The drums can get rather “Wipe Out”-like at times. Another skit, “The Sighting…,” soon follows. We hear a car speeding by and music on the radio. It turns out to be the Ghastly Ones driving and getting interrupted by the arrival of a UFO and its occupant. The acting and dialogue are hilarious and really makes me wish that this was a real movie. Heavy, pounding guitars and drums over a spacey “woo” noise signal the arrival of the namesake of “Shockmonster Stomp.” The name is almost certainly based on the old “Shock Monster” mask and I also suspect that mask was used for the pictures of the Astro-Zombie type beings mentioned earlier. The organ-sounding keyboard gets big role here and backed by drums, although it has a non-organ sound at times. The “woo” returns over the music and really rocking guitars appear about two minutes in. We hear shocks, scream and roar sound effects at the end. “Now Fear This” starts with fast guitars and percussion backed by organ-like keyboards. There’s fun-sounding “organ” work and rocking background guitars here. That’s right, guitars aren’t always the lead in this, although they do work with the keyboards to form the end buildup. “Weird Spaceship…” is another skit, this time featuring the band exploring the spaceship while we hear space sounds and footprints. They eventually stumble across the find the blood countess and do a great routine about tomatoes. Medium guitars and a male yell open “Spooky Girl.” Percussion and organs lead to vocals about a girl who “lives on top of a haunted hill.” Tambourine-like cymbals and guitars back things and we get a guitar solo and echoing yell often. “Double Agent 73 (who came in from the cold)” has a reverbing guitar intro followed by drums, light “organ” work and the occasional cymbal strike. Drums build up at one point and a strumming, rock riff does at others. A keyboard pulse opens “Full Throttle, Empty Bottle,” and soon drums enter, then fast guitars. This track has a very interesting keyboard style and the organ sound used at times too, often with cymbals. Everything gets really wild about two minutes in, which signals a minor change in style until the drum-filled (but not exclusive) end. “Flying Saucers Over Van Nuys” starts with space sounds, keyboards and slow cymbal strikes plus a guitar. An “organ” plays a funeral dirge and the reverb guitars builds up to faster, peppier beat. Fast drums, board and guitars play while the “woo” noise enters. The guitars and drums change style until it leaves and the keyboard briefly returns and exits before the ending. The opening of “Dimension 66” consists of fast percussion and guitars layered over light keyboard use. I really liked the guitar work in this track. The beats get harder and harder, then go back to the original style before we hear a sample about a female monster. “Brand New Sin” starts with a fast, rocking guitar, percussion and “organ” special. The guitar dominates over the light other stuff, which forms a very catchy beat under the male vocals. The lyrics include shout-outs to various horror figures like Jack the Ripper, Dr. Phibes, Sister Hyde, and Dr. Butcher. “Llorona” appropriately starts with female wailing sound effects, given the origin of the name, then march-like drums and a slow guitar follow. After a scream guitars start low, but rapid drums get them to increase in volume and (somewhat) in speed. Organ-like keyboards take over at times and there’s good use of alternating drum beats and guitar riffs as well. “Scuzz Ghoul Meets Curl’s Girl” starts with pulsing space sounds and screams that continue until an echo effect is added. Fast guitars and drums immediately burst in after. The style changes up to a slowish pace and then a jaunty “organ” takes over, but drumbeats start the change back to the old ways. Likewise, an echoing scream signals the closing guitars. “I’m In…” is the final skit on the album, wherein the countess’ plans are revealed. In “Orbitron,” fast guitars and the occasional drum beat changes into fast drums and “organ” with the occasional guitar riff. The riffs get longer and more involved later on. Everything gets louder and heavier at one point and later changes styles again – similar to the original style, but with more guitar work. Some might say they’ve saved the best for last, but I love far too many of the tracks here to concur. Also, a hidden track that starts after a lengthy wait reveals eerie sound effects and echoing screams. Next comes Unearthed, whose cover depicts a snazzily dressed green fellow lugging a large bag in front of an open grave. There some pictures of the band on the inside, including a faux lobby card. 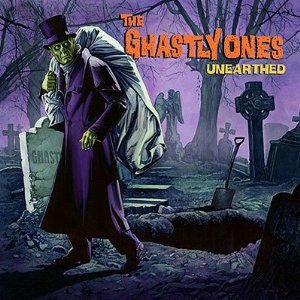 The titular track “Unearthed” opens with digging, breathing and wind effects. This is soon followed by pounding drums, church bells and spooky organ music. The our host, the Ghastly Ghoul (C. Nelson) explains we’re listening due to loving the “weird, strange, and supernatural” and leads into the next track. Slow guitar cords lead to a riff, then fast guitars and drums over light organ (it’s a real one this time around) in “Ghastly Stomp.” It’s so light you can barely hear it. I love the rocking, wailing guitars in this. Cymbals and guitars get a solo of sorts, but the organ comes in and cranks things up with sound effects. “Robot Atomico” starts with electric effects and fast drums backed by heavy guitars. The organ soon arrives to spice things up for a bit. There’s odd (but cool) guitar effects in this as well. The “woo” sound from Target: Draculon returns for a spell, but gets taken out by the drums and organ. Said drums can be bongo-like at times. I suspect that the name might be loosely based on the original untranslated title of The Robot vs. The Aztec Mummy. The sounds of revving and zooming cars kick off “Haulin’ Hearse.” Fast guitars and percussion add to the rocking, rapid feel, although the drums dominate at times. The organ soon arrives as well. “Yuzo’s Twist” is one of two songs on the album not originally by the Ghastly Ones. The medium (in terms of both speed and volume) guitar soon gets louder and faster when the other instruments join in. There a lot of nice change ups between the guitar and drums before the organ closer. “Hangman Hangten” opens with the sounds of wind and spooky bird calls. Marchlike drums play while the guitar plays a funeral dirge. After a coffin opens we get fast guitars and percussion, just the way you like it (along with the occasional chant of “hey hey hang ten”). What seems to be a sample acts as a prologue to “Spooky (Diablo’s Theme).” As I recall, a man says “Don’t be afraid…unless you’re beautiful and alone in your bedroom” followed by a woman crying and screaming. Rocking guitars, fast drums and the occasional organ are both rocking and spooky. There’s also a cool reverb pseudo-solo. Oh, and remember the proto-GdL16 countdown I mentioned in my Daikaiju review? This song was also used in it. Eerie moaning and wave sounds set the stage for “Banshee Beach.” Heavy drums and slow mournful guitars play, then the drums speed up while the guitars follow suite. Light organ work is later layered underneath. There’s a really cool guitar interlude at one point, too. “Werewolves on Wheels” (inspired by the film of the same name) appropriately opens with revving sound effects, then great ghastly guitars play over bass. Percussion and organ later join in. The organ is much louder in this song, but is not the focus. “Los Campiones del Justicio” is undoubtedly inspired by the Mexican El Santo, Blue Demon and Mil Máscaras (which are also chanted during the song) shows that the two are not the same, as “Los Campeones Justicieros” had more than three members and El Santo was not a part of their roster. However, the lucha libre dream team of El Santo, Blue Demon and Mil Máscaras was featured in Las Momias de Guanajuato. After the echoing response of track name, we get slow guitars and fast cymbals. Things speed up when drums enter the picture and the organ is not far behind. As you might guess, there’s a Mexican feel to this track. The cheering crowd sample at the end is a great touch. “Everybody Up” is the second of the CD’s two songs that aren’t written by the Ghastly Ones. After the fast drums and guitars, the vocalist calls for everyone to get up and light organs can be heard if you listen hard enough. Don’t miss the brief, but rocking, guitar solo. Interesting guitars are joined by fast, bongo-like drums in “Mysterion.” They become fast, normal drums when the organ joins in. Said organ gets a much larger role here despite being in background. “Surfin’ Spooks” opens with a sample and fast, heavy guitars, along percussion and organ with the occasional sound effect. It’s rather “Wipe Out”-like at times, especially the ghostly laughter. Wailing guitars blast the ghosts away and we get a buildup to the reverb ending. An eerie music stinger plays as our host asks us if we feel “The Icy Grip of Fear.” His little speech leads into final track: “(Everybody’s Doing) The Ghastly Stomp.” A reverb guitar is soon followed by a yell and percussion. Male vocals sing of a scary new dance called the “Ghastly Stomp” (the complete lyrics can be found in the liner notes). There’s plenty of great guitar work, as usual. There’s also the occasional cymbal crashes and amazing rapid drum work (provided by guest drummer Dave “Grave” Klein) overtakes the guitars and leads into slow ending, which involves a final yell and birds that cry out and fly away. As was the case with the last album, waiting awhile after that reveals a secret track. Said track plays a sample asking “how much shock can you stand?” This leads to a quick instrumental piece involving fast guitars, drums and cymbal strikes. Special thanks to The Ghastly Ones for the review copies!